Posted in: Uncategorized. 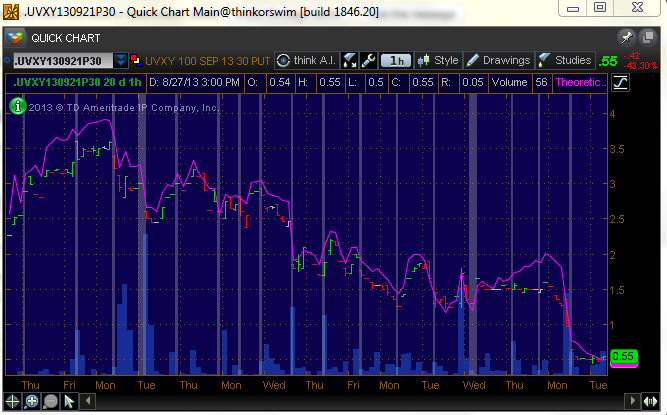 Tagged: uvxy, VIX, Volatility, VXX. How long has it been since we had so many issues relegating investors to the sidelines? Syria, debt ceiling, Fed meeting, budget debate, Fed chair nominee (Summers-being-worse-than-Yellen risk). It was inevitable that the VIX would rise with all of these headwinds, while volume the last two days was not typical of much fear; but the VIX at 16.8 or so is not exactly screaming fear either. 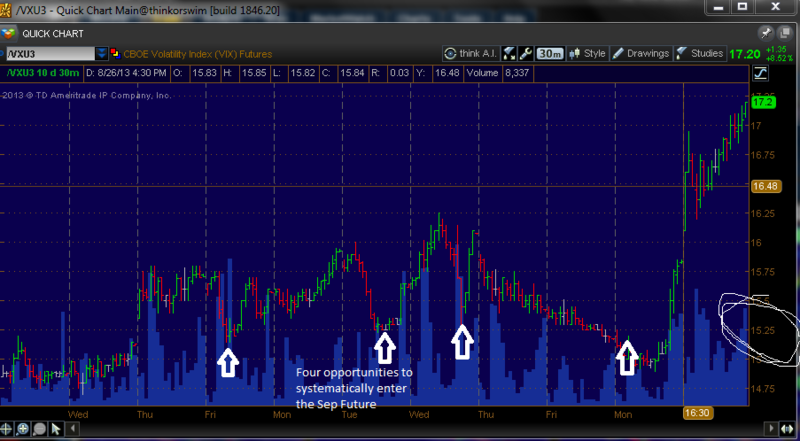 Therefore, vol sits in a mid range, it can go higher or lower from here. 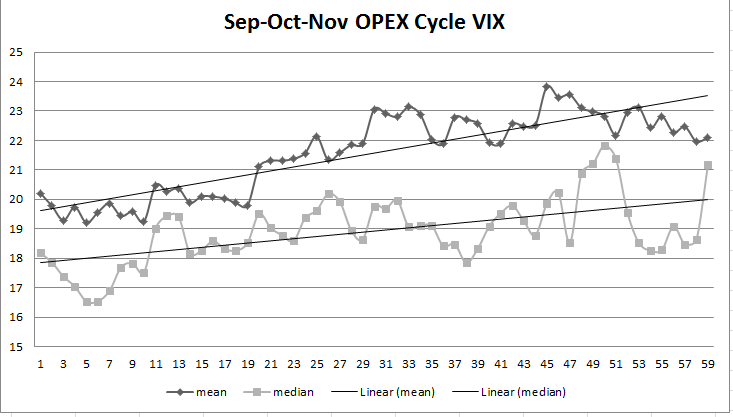 I’ve mentioned several times that a VIX at 15.25 is buy-able due to the event risk ahead, and that worked again. Now it gets difficult. Is there a short opportunity? Maybe. But the main question is how the real traders react next week. And what transpires in a kind of pointless exercise we will go through to annoy but not remove a tyrant. Â I put on a small calendar short vol trade using the UVXY, short the weekly $39 puts for .54, long the Sep 20thÂ $39 put for $3.54, for a net debit of $3. I don’t really care what happens to this trade until the end of next week really, because I want to sell another week against it on Friday or Tuesday. If vol comes out this week, which would be a curve-ball, I will just close it if I get $5+. This is a day trading vehicle and one guarantee in the life of this thing, regardless of short-term volatility, is that if you short it, you will win. The only risk is to ensure that you do not get stopped out by margin on large spikes in vol. It can easily double in a situation where the futures rise from 15 to 23. Not a stretch by any means. If the futures come back to 15 or so, this can clear $1.50 at a price of .55. But you will need what I call a volatility exhale, and it is probably going to take a Fed-via-Hilsenrath leak of the meeting outcome or a quick end to the Syrian uncertainly. Good economic data is bad and bad economic data is bad right now, so don’t look for something there to depress vol. The job report next Friday carries a lot of uncertainty (even though it has a margin of error of +/-100k jobs, so it shouldn’t), so that is just another log to throw on the fire over the near-term. In the meantime, I grabbed a few weekly IWM puts at $100 for .44, and if the market does not follow through with downside tomorrow, I will be out of that trade. 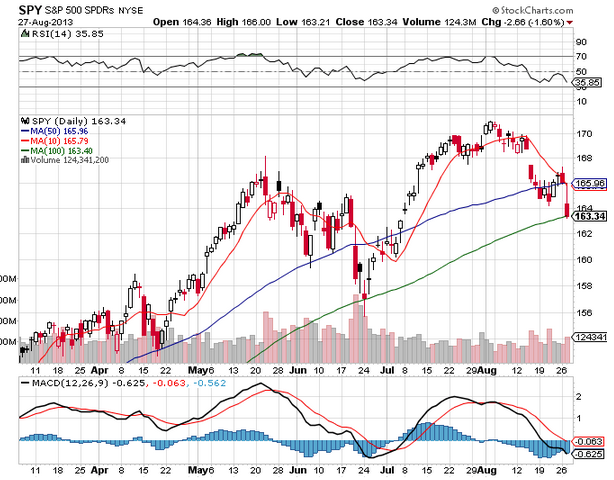 The IWM broke the 50 day after holding up better than the broader market, so it has room to fall to lower levels.